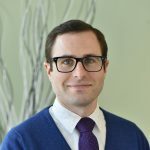 Patrick Kelly is a Senior Healthcare Analyst at CHRT. He provides leadership for projects in CHRT’s research and evaluation portfolio. He is responsible for grant writing, managing projects from startup to completion, developing and executing project work plans, monitoring short and long-term goals, maintaining project scope, documenting procedures, identifying best practices, engaging collaborators, facilitating teamwork, overseeing data collection, ensuring compliance, and disseminating results. He has skills in the development, management, evaluation, and dissemination of research, programs, and policies. He is particularly interested in work seeking to create sustainable, multi-level system and policy changes in order to improve opportunities for vulnerable populations to live healthy and productive lives by addressing social and environmental determinants. Before coming to CHRT, Patrick served as a project manager at the University of Michigan Institute for Social Research, where he oversaw data collection and operations on the National Survey of Family Growth, a cross-sectional survey gathering information on family structure, marriage and divorce, pregnancy, fertility, use of contraception, as well as men’s and women’s health. Prior to that, he spent six years at University of Michigan Center for Managing Chronic Disease managing evaluations for several community-based initiatives designed to improve health equity and providing technical assistance for a Centers for Medicare & Medicaid Services demonstration project. His first foray into the public health workforce was as an intern with the Michigan Department of Community Health’s Healthy Homes University program, a home-based environmental intervention and health education program for low-to-moderate income families with pediatric asthma in Michigan. Patrick holds a Master of Public Health degree from the University of Michigan and a Bachelor of Science degree from Michigan State University.